THE FOLLOWING NOTICE is hereby published for general information. By order of His Excellency the High Commissioner and Administrator of the Transvaal. WE Davidson, Acting Secretary to the Transvaal Administration -3rd June 1902. Desirous to terminate the present hostilities, agree on the following Articles. 1. The BURGHER Forces in the Field will forthwith lay down their Arms, handing over all Guns, Rifles, and Munitions of War, in their possession or under their control, and desist from any further resistance to the Authority of HIS MAJESTY KING EDWARD VII, whom they recognise as their lawful SOVEREIGN. 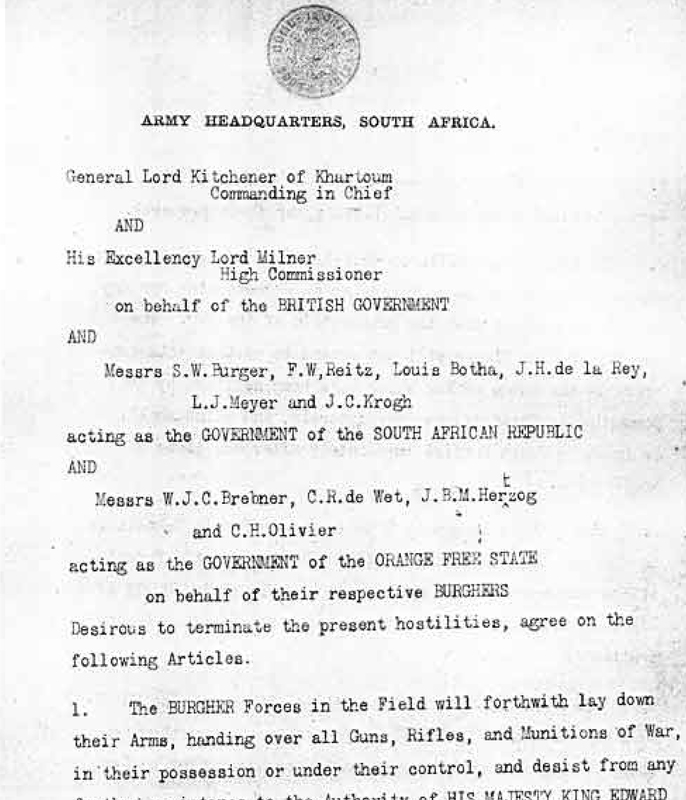 The Manner and details of this surrender will be arranged between Lord Kitchener and Commandant General Botha, Assistant Commandant General de la Rey and Chief Commandant De Wet. 2. Burghers in the field outside the limits of the TRANSVAAL and ORANGE RIVER COLONY, and all Prisoners of War at present outside South Africa, who are burghers, will, on duly declaring their acceptance of the position of subjects of HIS MAJESTY KING DWARD VII, be gradually brought back to their homes as soon as transport can be provided and their means of subsistence ensured. 3. The BURGHERS so surrendering or so returning will not be deprived of their personal liberty, or their property. 4. No proceedings CIVIL or CRIMINAL will be taken against any of the BURGHERS so surrendering or so returning for any Acts in connection with the prosecution of the War. The benefit of this clause will not extend to certain Acts contrary to the usage of War which have been notified by the Commander in Chief to the Boer Generals, and which shall be tried by Court Martial immediately after the close of hostilities. 5. The DUTCH language will be taught in Public Schools in the TRANSVAAL and the ORANGE RIVER COLONY where the Parents of the Children desire it, and will be allowed in COURTS of LAW when necessary for the better and more effectual Administration of Justice. 6. The Possession of Rifles will be allowed in the TRANSVAAL and ORANGE RIVER COLONY to persons requiring them for their protection on taking out a licence according to Law. 7. MILITARY ADMINISTRATION in the TRANSVAAL and ORANGE RIVER COLONY will at the earliest possible date be succeeded by CIVIL GOVERNMENT, and, as soon as circumstances permit, Representative Institutions, leading up to self-Government, will be introduced. 8. The question of granting the Franchise to Natives will not be decided until after the introduction of Self-Government. 9. No Special Tax will be imposed on Landed Property in the TRANSVAAL and ORANGE RIVER COLONY to defray the Expenses of the War. 10. As soon as conditions permit, a Commission, on which the local inhabitants will be represented, will be appointed in each District of the TRANSVAAL and ORANGE RIVER COLONY, under the Presidency of a Magistrate or other official, for the purpose of assisting the restoration of the people to their homes and supplying those who, owing to war losses, are unable to provide for themselves, with food, shelter, and the necessary amount of seed, stock, implements etc. indispensable to the resumption of their normal occupations. His Majesty's Government will place at the disposal of these Commissions a sum of three million pounds sterling for the above purposes, and will allow all notes, issued under Law No. 1 of 1900 of the Government of the SOUTH AFRICAN REPUBLIC, and all receipts, given by the officers in the field of the late Republics or under their orders, to be presented to a JUDICIAL COMMISSION, which will be appointed by the Government, and if such notes and receipts are found by this Commission to have been duly issued in return for valuable consideration they will be received by the first-named Commissions as evidence of War losses suffered by the persons to whom they were originally given. In addition to the above named free grant of three million pounds, His Majesty's Government will be prepared to make advances as loans for the same purpose, free of interest for two years, and afterwards repayable over a period of years with 3 per cent interest. No foreigner or rebel will be entitled to the benefit of this Clause. Signed at Pretoria this thirty first day of May in the Year of Our Lord Thousand Nine Hundred and Two.